ironSource Ad Placements offer more control of where and how ads are served within your app (i.e. on app load, end of level, store etc.). We currently support ad placements for all our ad formats, i.e. Rewarded Video, Interstitial, Banner and Offerwall. In addition, you can now also pace and cap your placements to ensure the ultimate user experience! The Placement tool can be found under Monetization within the Settings tab under Ad Units and you must set separate placements for our different ad formats. 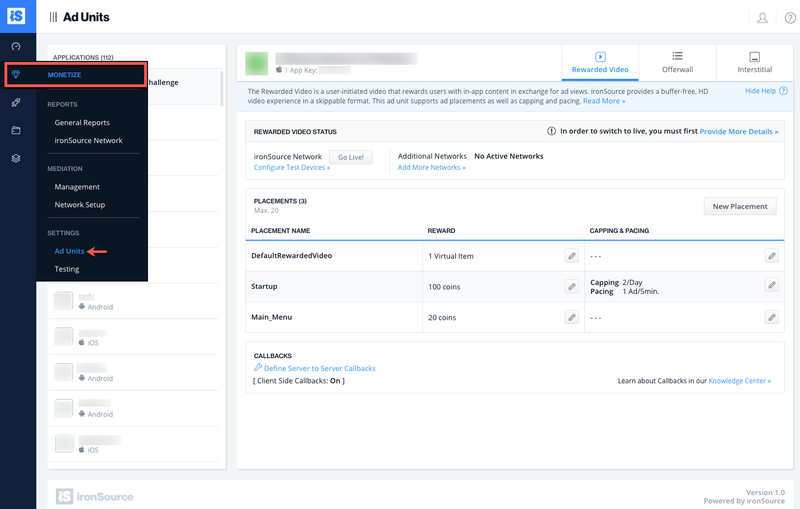 This tool allows you to gain control over your ad performance and offers advanced enhancements in your user’s ad experience. With Rewarded Video and Offerwall placements, you can configure different Reward Types and Reward Amounts for specific placements. 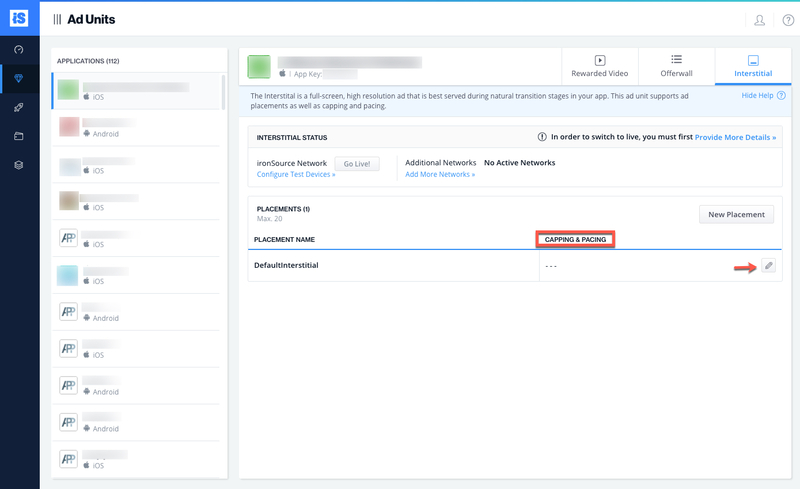 By default, your apps will have a pre-defined default placement for each ad unit. If you are looking to award your users with one type of reward in a single location in your app, you’re all set! Just use the default methods provided in the SDK and don’t worry about setting up any additional placements. Why should you create additional placements alongside the default placement? You want to serve the Offerwall, Rewarded Video or Interstitial ads in different locations within your app to enhance user experience. Popular placements include on app launch, in between levels, at game over, on the home screen, etc. If serving Rewarded Videos or Offerwall in your app, you might be interested in rewarding users with different in-app items based on their location in the app. You may want to offer the user the choice to watch videos for several different rewards items e.g. coins, swords, elixirs, etc. You can create multiple placements to map to the various Rewards and grant the user the corresponding reward based on their selection in app. For example, you’d like to portray a Rewarded Video trigger between levels and offer ‘elixirs’ in return for a completed view while also displaying the Rewarded Video trigger in the in-app store which will reward users with ‘coins’. Using additional Ad Placements will enable you to create two different placements with different reward types. You can then compare the performance of this reward in the different locations in your app. Note: The Reward Type & Reward Amount of each placement can be easily controlled on the Placement Module as well as updated easily and quickly. This flexibility means you can make adjustments easily and refine the Placements based on data and analytics associated with each placement in the Supersonic Reporting. You can increase the reward amount to boost engagement, or change the reward type if you see a certain placement isn’t so popular. You can now achieve all of this in real-time without touching your client-code! We currently support Placement Capping & Pacing for Rewarded Video and Interstitials. Placement Capping will limit the amount of ads you serve for the selected placement. You can set limitations by day or hour. This enhances the user experience immensely as your app will refrain from serving too many ads in the same location. 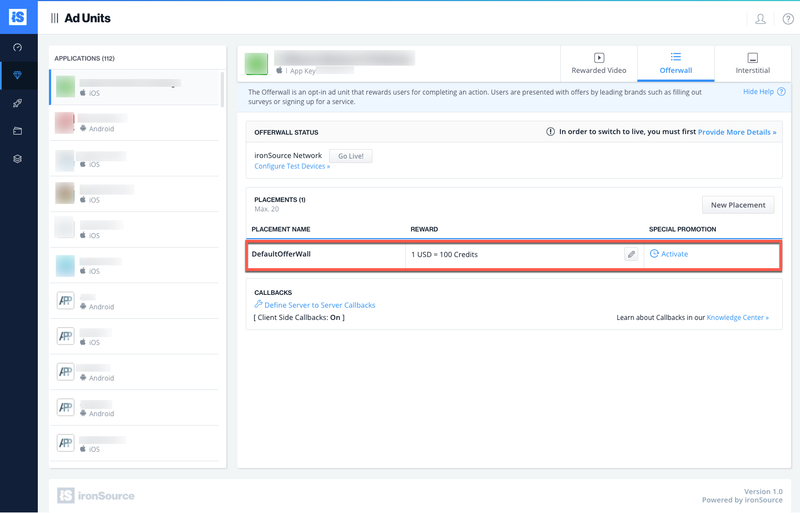 For example, if you set a placement at app launch with capping you can ensure that a user who opens your app several times will not always see an ad at app launch. 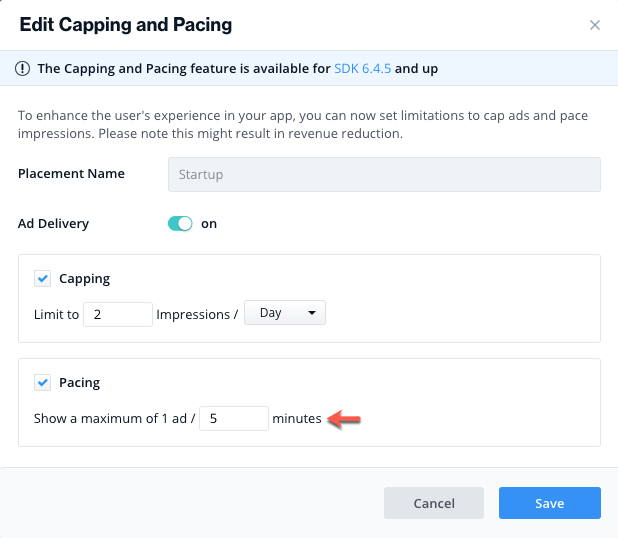 Placement Pacing gives you control over the time interval between ads for the selected placement. For example, if you have an ad placement at app launch and a user opens your app, he will see an ad for this placement. If s/he then navigates out of the app and back within 15 minutes, he will not see an ad at app launch. To set up your placements, navigate to Monetize and under Settings ➣ Ad Units on the ironSource dashboard. Select the app and the ad unit you’d like to set a placement for and click on ‘Add Placement‘. Alternatively you can choose to edit the Default placement. Select the Placement Name from the list or enter a custom name. In the Item Name field, name the virtual item that will be rewarded the user for a video completion. Note: You will not see this field or the below for Interstitial Placements, as Interstitials are not rewarded ad units. 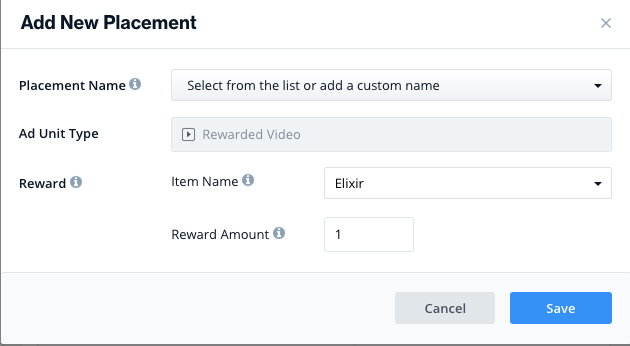 In the Reward Count field, enter the amount of items to reward the user for a single video completion. You have successfully added a placement for this ad unit! 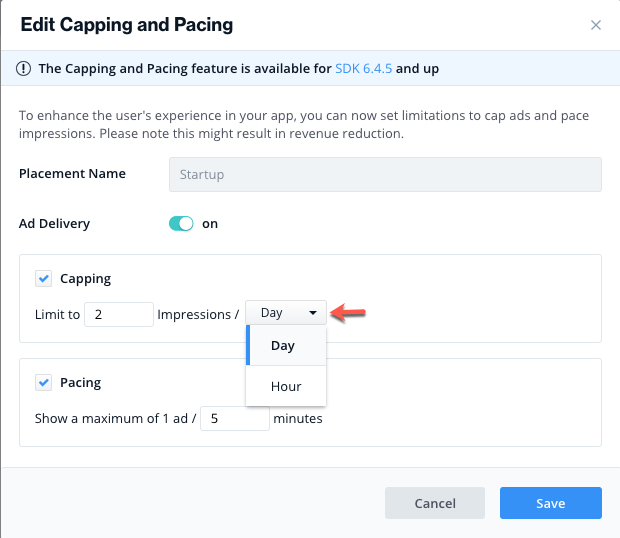 Now you can continue and configure Placement Capping and Pacing to enhance the user experience in your app. Simply click on ‘Edit’ for the placement you’d like to cap or pace. Note: Capping and pacing your ads might result in revenue reduction.